I have seen this ad a number of times on my Facebook page, and it took me a while to figure out exactly why it bugged me. In some sense, it was true. I had been damaged by anorexia, yet I really get squeamish about thinking of myself that way. I don't like thinking of myself as "damaged." My illness has changed many aspects of myself--some for the better, some not so much. But as much as anorexia may have altered me, it hasn't damaged who I am. Yes, anorexia has caused a whole host of damages in my life. The physical ones are a good place to start; my bone density has improved, but it's still sub-par. I tend to be a lot more hesitant, wary, and cynical than I was before. I'm more easily hurt. These are some of the damages that have been done. But I don't think of myself as "damaged goods." I'm battered, bruised, and scarred, but hell--who isn't? It's called parts of life. I have way more scars than I'd like to have, and some very interesting stories that probably shouldn't be shared with polite company. What that means is that I've survived some pretty heady stuff, had some very close calls, and (hopefully) learned my lesson. It doesn't mean I am damaged. I damage my car in a fender-bender. I damage my iPod when I drop it. I can hurt, harm, wound, and maim other people. But that doesn't make them damaged. It makes them victims of my temper and pettiness. My bones are a victim of my anorexia. I suppose that seeing myself as "damaged" would mean incorporating that damage into who I am as a person. My eating disorder has fundamentally changed me. It's altered many aspects of myself. And yet, I'm still Carrie. Maybe a different Carrie, and older, wiser, and more battered Carrie, but I'm still me. If anorexia damaged me, then it seems like I'm permanently messed up. It's one thing to try and fix a damaged car--or even, say, damaged skin and nails. It's quite another to try and fix a damaged person. I really like this post Carrie :) I very much dislike some of the language/jargon that is used by 'the eating disorders community', treatment providers etc. I had AN for many years, and, like many people with the illness have irreversible health problems. (Fortunately some of these problems were reversible). Recovery has been very difficult, and I know that I must remain vigilant for the rest of my life - to ensure that I eat, even at the times when I least want to, and that I don't over-exercise. However, I don't consider myself a 'victim' or 'survivor'. I don't like the 'tragic life story' stuff. I don't get all poetic about my anorexia. I'm just not 'gushingly emotional' in that way. Like you, I intellectualise stuff. I have worked hard to recover and I am proud of myself for having achieved a state of recovery I never thought possible. That's the most emotional I will get. Agreed. AN has definitely changed me and affected all aspects of my life, but I think in some ways it has left me stronger, more independent and self-aware and conscious of my thoughts and actions, and more empathetic for people with other mental health issues. If I could go back, I wouldn't choose to go through it again, surely there's another way to build those traits up, but I do think that my character has been bolstered by my experiences with the disorder. Hitler, Dahmer- THOSE are "damaged" people. People who let their brokenness shape them into something not so much human anymore. ED survivors? Not damaged. Not any more damaged than a soldier who's seen battle, a person who's grieved a loved one dying, a victim of any other illness. Maybe in need of medical and therapeutic assistance to heal the hurts, but not damaged. There are plenty of things that are actually BETTER after some time and wear- hardwood floors, soft t-shirts, day old fruitcake. Your ED may have bred some cynicism, but I bet it has also bred empathy. It may have left painful reminders and scars on your body, but I bet it has also caused you to appreciate and strengthen parts of your body more than you would have before (biking thighs perhaps?). You can strengthen your muscles to protect your bones, you can strengthen your empathy to protect your cynicism. You can dig up and face those hurts now that you wouldn't have faced before, because now you know what NOT facing them could cost you. An ED is what you make of it, in the end- something that kills you or something that teaches you. Wonderfully framed and expressed, Carrie! That ad made me go yuck! Damaged sounds permanent, unfixable. 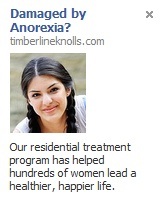 Perhaps that's my problem with it as a descriptive of people with anorexia. I've seen this ad a lot on my FB page, too (along with plenty of diet ads - FB's marketing schemes continue to confuse me) and didn't care for it. "Damaged?" I just don't care to think of myself that way. All of us go through things in life that change us in different ways, for me, anorexia has been just one of those things that has shaped who I am today. Other things also have shaped me - marriage, being a reporter, graduate school, etc. And at 45, I expect to be different and changed from when I was 25 or else something went wrong! Also damaged implies something broken, something that needs to be fixed and I remember a tx. center I was at that tended to treat the eating disorders patients as people who needed to be fixed of our "urges" and "symptoms" (and that's all it felt like we were - sets of urges and symptoms), instead of whole people with real lives and interests and opinions who just needed *treatment* that we could use in helping ourselves with our own recovery. As someone else pointed out, people like Hitler and Charles Manson are those I think of damaged - damaged beyond repair. Do I think I am damaged as a consequence of AN, or that I was damaged before I developed AN? No, I don't. At least, not brain-wise. Yet, we seem to be developing a culture whereby we attribute all mental illness to neurological brain 'quirks' of genetic origin, neglecting inter-personal or life experiences and individuals' subculture within broader society. Even if no-one is suggesting these quirks = damage, it wouldn't be surprising if some people were to draw such a conclusion. Of course, genetic factors influence temperament and character, but we need to take into account epigenetic phenomena, the plasticity of the brain and the capacity to learn. i dont think i see myself as damaged. i see myeslf as hurt. bc damaged means destroyed, it means not being able to come back. but hurt means fixable. it means theres a light at the end of the tunnel.